If you have lost files or folders on your computer, please follow the steps below. If you're looking for files on your mobile app, read about finding files in OneDrive for Android, iOS, or Windows Phone. If you have Files On Demand enabled, or if you choose to only sync certain folders, going online will allow you to search all your files and folders. Sign in to the OneDrive website at https://www.onedrive.com. Use Search everything to look for your files. On the left side of the page, click Recycle bin. If you find the item you're looking for, select it and choose Restore at the top of the page. If you cannot find the item in a long list, you may choose to Restore all items at the top of the page. Office 365 subscribers can restore their entire OneDrive to a previous time. Go to Files Restore to undo all the actions that occurred on both files and folders within the last 30 days. Learn more about Restoring your OneDrive. It might be that you are not logged in to the correct Microsoft account and your files are safely on another OneDrive. 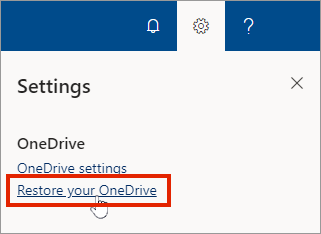 If you are a OneDrive for Business user, you might have accidentally saved your files to your business account instead of your personal account. To check for the files in OneDrive for Business, check the OneDrive for Business tab above. Did you use someone else's computer or account when saving the file? If so, sign out of your OneDrive and sign in again using the other account. It may be that a file has not yet synced. Files saved with Office 2016 upload to OneDrive first, and then sync with your local PC. If you’re having trouble syncing Office files, the Office Upload cache system may be interfering with OneDrive sync. Try turning off the related setting in OneDrive settings. On iOS devices that have photos optimized for iCloud, the photo is not stored on the device and cannot be uploaded to OneDrive. To disable iCloud optimization on your iOS device, tap Settings > iCloud > Photos and uncheck Optimize Storage. If the OneDrive account has been inactive for 2 years, the files may have been deleted. The names of the files or folders you are trying to find. If the files are photos/videos, tell us the date you took them. Approximately when you last accessed the files, and on which device (e.g., PC, Android, iPhone). Consent that we can search your file history for you. If you’ve followed the steps in this article and still need help, email the OneDrive support team. 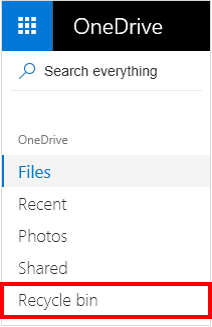 Select the blue OneDrive icon, choose More, then View online. 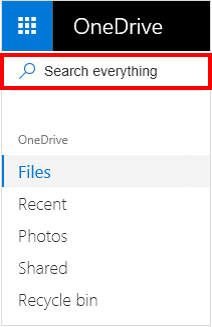 Use Search OneDrive to look for your files. OneDrive for Business users can restore their entire OneDrive to a previous time. Go to your OneDrive online Settings to undo all the actions that occurred on both files and folders within the last 30 days. Learn more about Restoring your OneDrive. It might be that you are not logged in to the correct Microsoft account and your files are safely on another OneDrive, such as your personal OneDrive account. To check, sign out of your OneDrive and sign in again using the other account. Files not found via search or in the OneDrive Recycle bin usually cannot be retrieved. To have your IT administrator or someone from support investigate, please provide the following information. The names of the files or folders you are trying to find. If the files are photos/videos, the date you took them.